All eyes in the USA were focused on London last summer, with the Queen’s Jubilee and the 2012 Summer Olympics drawing throngs to the vibrant city. And in any coffee shop in Lawrence these days, you’re liable to hear customers discussing the misfortunes of the aristocratic Crawley family on “Downton Abbey” as much as the local weather forecast. Although your budget might not allow you to hop across the pond this spring, there are still places within an easy day’s drive of Lawrence where Anglophiles can get their British fix. Just minutes away in Baldwin City, Baker University’s campus is home to a Methodist chapel that originated in 1864 in the tiny village of Sproxton, England. After 124 years as a place of worship, the Sproxton Chapel was closed in 1988, and the building was put up for sale. The Clarice L. Osborne Memorial Chapel was moved, stone by stone, from England to Baker University. 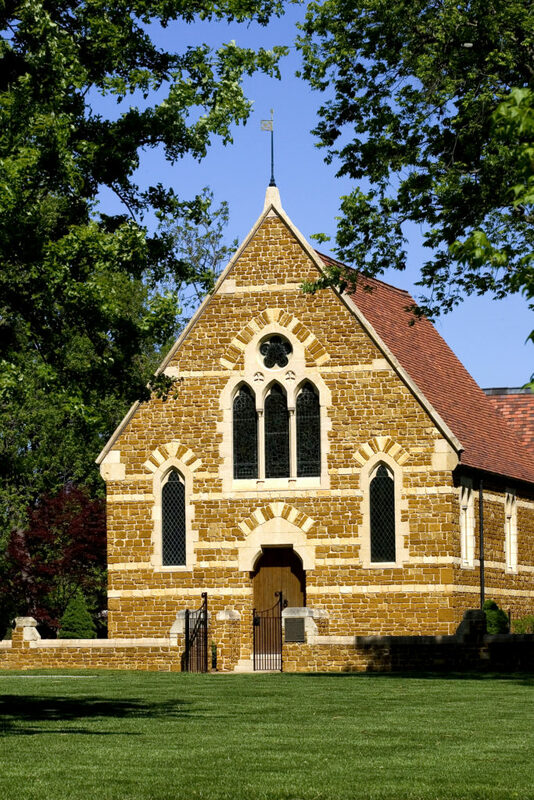 The late Margaret Thatcher attended the chapel as a child. Baker University bought the chapel, with funding from Robert R. Osborne of Olathe (to dismantle, ship and rebuild it), and it was named after Osborne’s wife, Clarice. The first crates of chapel stones arrived at Baker in the fall of 1995. The chapel was dedicated at Baker in 1996 by Lady Margaret Thatcher, former British Prime Minister, whose father had preached in the building. The sanctuary is a museum room containing artifacts. To the rear of the chapel is a formal English-style garden. Osborne Chapel is open to visitors 6 a.m. to 6 p.m. on weekdays, and 8 a.m. to 6 p.m. on weekends. That glowworm shone brightly during the darkest days of WWII, leading his country through battles and becoming a symbol for victory. 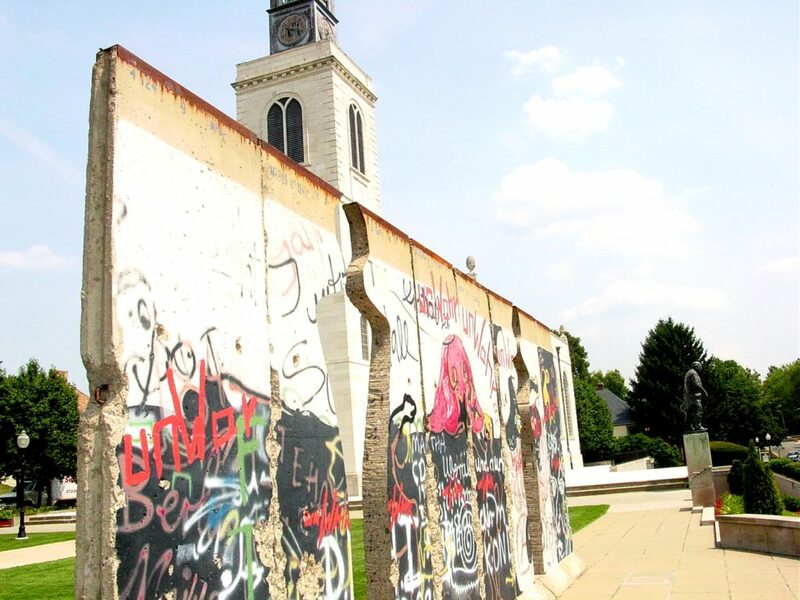 The Breakthrough Sculpture in Fulton, Mo., created by artist Edwina Sandys, a granddaughter of Winston Churchill, was made with eight consecutive sections of the Berlin Wall. 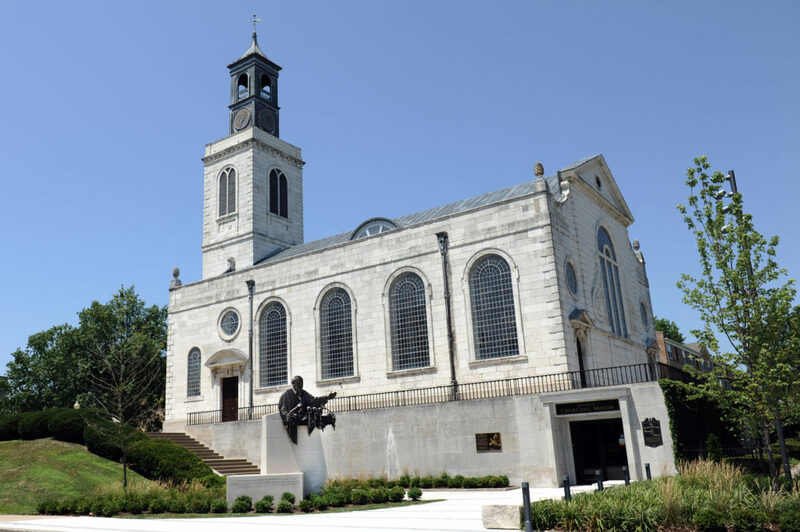 The entrance to the National Churchill Museum is below the Church of St. Mary in Fulton, Mo. Winston Churchill delivered his famous “Iron Curtain” warning in Fulton in 1946. The museum underwent a million renovation in 2006. After the war, Churchill lobbied for peace. At Westminster College in Fulton, Mo., in 1946, Churchill warned of the “Iron Curtain” in the USSR and urged Anglo-American preparedness. At the National Churchill Museum in Fulton (which underwent a $4 million renovation in 2006), you can explore Churchill’s life experiences through a series of interactive exhibits that are engaging for young and old alike. You can experience the sights and sounds of life in a trench on the Western Front during World War I, see and hear the effects of a London air raid at the height of the Blitz as you’re placed in the midst of a dazzling light and sound show, decipher WWII secret codes like a spy, or just sit back in an overstuffed chair surrounded by the ambience of an English gentleman’s club. When you look at some of the artifacts in the museum and read some of Churchill’s personal letters, you do get the view of a very human, albeit very distinctive, man. He loved animals, and cats and dogs reigned over his home and even wandered into official meetings at 10 Downing Street. One secretary recalled finding Churchill working in bed one morning with a bird on his head, a cat across his ankles and a dog at his side. In addition to the wealth of displays about Churchill, you can also tour a memorial to him, the Church of St. Mary the Virgin, Aldermanbury — a former medieval parish church in London that was ruined by the Great Fire of London in 1666, then rebuilt using designs by Christopher Wren, only to be ravaged again during the London bombings in WWII. In 1965 the 7,000 stones of this church were shipped to the United States to be reconstructed at Westminster College. Finally, you can marvel at the 11-foot-high by 32-foot-long “Breakthrough” sculpture designed by artist Edwina Sandys, another Churchill granddaughter, from eight sections of the Berlin Wall (complete with original graffiti), just one year after its fall. Of course, there’s nothing like a visit to Lawrence’s own Brits, 929 Massachusetts St., which stocks such an abundance of British food, drinks and “Downton Abbey” DVDs that even the Dowager Countess would approve.